Entertainment Earth has this great Christmas present for uber geeks to keep your favourite canned Christmas Cherry Coke timelessly cool and Dalek additive free! 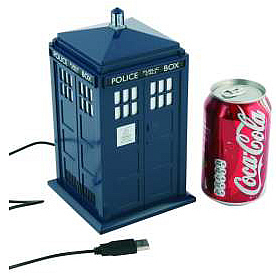 The Doctor Who TARDIS USB Micro Fridge sends your favourite canned beverage through time and space to get that deep space chill only the TARDIS can deliver. please note however that current Earth technology limitations mean that only your canned beverage may enjoy time and space travel and not you. Head over to Entertainment Earth and pre order the wee beastie!